Kazuya Ogawa., et al. Synthesis and Optical Properties of Bisporphyrin Conjugated with Naphthalene Bisimide. (2017) J Nanotechnol Material Sci 4(1): 14-18. © 2017 Kazuya Ogawa. This is an Open access article distributed under the terms of Creative Commons Attribution 4.0 International License. Novel D-A-D type ethynylene-linked bisporphyrin conjugated with naphthalene bisimide as an electron acceptor was synthesized by palladium-catalyzed cross-coupling reaction. The red-shifted Soret and Q bands were observed in UV/visible absorption spectra, showing expansion of π-conjugation. The maximum effective two-photon cross section value was observed as 10100 GM at 960 nm measured using a nanosecond Z-scan method. This value was 1.3 times larger than the value obtained for bisporphyrin without electron acceptor. Two-Photon Absorption (TPA) is a nonlinear optical phenomenon which occurs through simultaneous absorption of two photons. Because of quadratic dependence on the incident light intensity in the TPA process, the efficiency becomes largest at the focal point, allowing a variety of optical applications such as three-dimensional optical memory, two-photon Photodynamic Therapy (PDT), and optical limiting. Porphyrin is a potential candidate for TPA materials because of its large π-conjugated electron system. 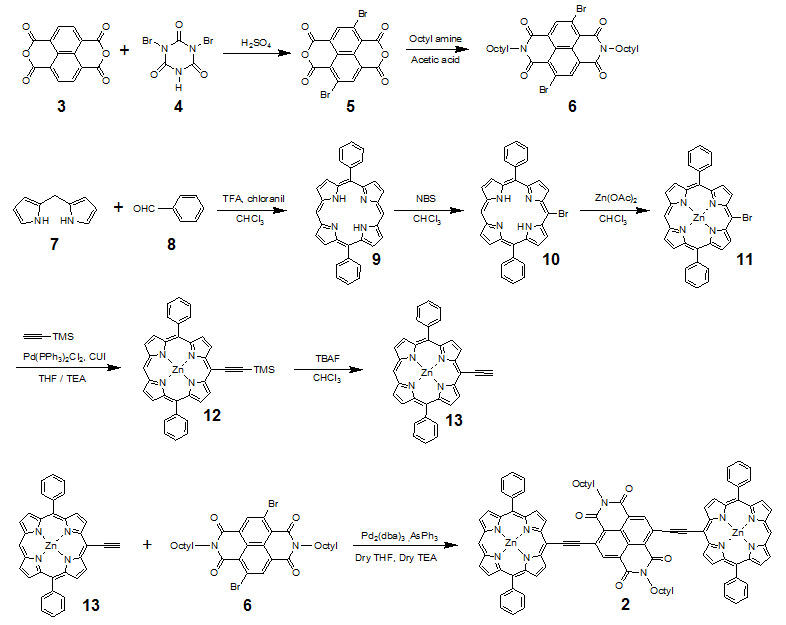 But simple porphyrins have only small σ(2) values less than a few tens of GM (1 GM = 10-50 cm4 s molecule-1 photon-1). Scheme 1: Structures of bisporphyrins 1 and 2. 1H NMR spectra were recorded on JEOL JNM-ECP 600 spectrometer. Chemical shifts are reported on δ scale with respect to TMS as an internal standard. Coupling constants (J) are reported in Hertz (Hz). UV-vis spectra were measured by a Shimadzu UV-3100 PC spectrometer. Fluorescence spectra were recorded using a Hitachi F-4500 spectrometer. MALDI-TOF mass spectra were obtained with a PerSeptive-Biosystems Voyager-DE STR spectrometer with dithranol as a matrix. TLC was performed on analytical glass TLC plates silica gel coated with 60 F254 (E. Merck). Column chromatography was performed using a column packed with either silica gel 60 N (Kanto Chemical, spherical, neutral, 63-210 μm). Preparative GPC was conducted using Japan Analytical Industry LC-908 (column; TSK gel G3000H, eluent; pyridine). Isocyanuric acid (95%), bromine (99%), octyl amine (98%), trifluoroacetic acid (98%), CHCl3 (99%), triethylamine (99%), N-bromosuccinimide (98%), zinc acetate dihydrate (99%), THF (99.5%), Pd(PPh3)2Cl2 (98%), and AsPh3 (95%) were purchased from Wako Pure Chemical Industries. Chloranil (97%) was purchased from Nacalai tesque. Isocyanuric acid (5.16 g, 0.04 mol), LiOH (1.92 g, 0.08 mol), and bromine (25.6 g, 0.16 mol) were added into 400 ml of water. After stirring for 2 hours, the reaction solution was cooled in refrigerator for 24 hours, and then white solid was separated by filtration to afford the title compound (84%). 1H NMR (600 MHz, DMSO-d6) δ 11.1 (s, NH). A solution of 3 (1.0 g, 3.73 mmol) in 6 ml of sulfuric acid was slowly added into a solution of 4 (2.14 g, 7.46 mmol) in 6 ml of sulfuric acid. After heating for 15 hours at 130°C, the reaction solution was added into ice. The precipitate formed was separated by filtration to afford 5 (84%). 1H NMR (600 MHz, DMSO-d6) δ 8.78 (s). Octyl amine (0.62 ml, 3.76 mmol) was added into a solution of 5 (400 mg, 0.94 mmol) in 32 ml of acetic acid. After stirring for 2 hours at 130°C, the reaction solution was added into ice. The precipitate formed was separated by filtration, and then purified by silica gel column chromatography (CHCl3) to give 6 (24%). 1H NMR (600 MHz, CDCl3) δ8.99 (s, 2H), 4.19 (m, 4H), 1.73 (m, 4H), 1.26 - 1.43 (m, 20H), 0.88 (m, 6H). Trifluoroacetic acid (0.6 ml) was added to a solution of dipyrromethane 7 (500 mg, 3.42 mmol) and 8 (727 mg, 6.85 mmol) in 600 mL of CHCl3. After stirring for 16 h at room temperature, triethylamine (1.2 ml) and chloranil (2.54 g, 10.3 mmol) were added. After stirring for 5 h, the crude material was concentrated and purified by silica gel column chromatography (hexane/CHCl3 =1:1) to give 9 (15%). TLC (hexane/CHCl3 =1:1) Rf = 0.30; 1H NMR (600 MHz, CDCl3) δ10.3 (s, 2H), 9.37 (d, 4H, J = 4.8 Hz,), 9.07 (d, 4H, J = 4.8 Hz), 8.26 (m, 4H), 7.76- 7.80 (m, 6H), -3.12 (s, 2H, NH); MALDI-TOF Mass C32H22N4 Calcd: 462.2; Found: 462.5. H21BrN4 Calcd: 540.1; Found: 542.8. Bromoporphyrin 10 (93 mg, 0.17 mmol) was dissolved in CHCl3 (40 mL) and 10 mL of a saturated solution of zinc acetate dihydrate in MeOH was added. After stirring for 30 minutes, the mixture was washed with saturated aqueous NaHCO3 and water (96%). 1H NMR (600 MHz, CDCl3) δ 10.2 (s, 1H), 9.80 (d, 2H, J = 4.2 Hz), 9.35 (d, 2H, J = 4.2 Hz), 9.03 (m, 4H), 8.20 (d, 4H, J = 6.0 Hz), 7.75 - 7.80 (m, 6H); MALDI-TOF Mass C32H19BrN4Zn Calcd: 602.0; Found: 603.1. A vacuum-dried Schlenk flask was charged with bromozincporphyrin 11 (89 mg, 1.5 × 10-7 mol) and filled with argon. Dry THF (12 mL), triethylamine (2.4 mL), Pd(PPh3)- 2Cl2 (5.6 mg, 1.8 × 10-5 mol), CuI (0.74 mg, 9 × 10-6 mol), and TMS-acetylene (70 μl) were added into the flask under argon atmosphere. After stirring for 4 hours at room temperature in the dark, the reaction mixture was washed with saturated aqueous NH4Cl and water, and extracted with CHCl3. The crude product was purified by silica gel column chromatography (CHCl3) to give 72.8 mg of 15 as a red solid (78%). 1H NMR (600 MHz, CDCl3) δ10.2 (s, 1H), 9.80 (d, 2H, J = 4.8 Hz), 9.34 (d, 2H, J = 4.8 Hz), 9.03 (m, 4H), 8.22 (d, 4H, J = 6.0 Hz), 7.78 - 7.81 (m, 6H), 0.62 (s, 9H); MALDI-TOF Mass C37H28N4SiZn Calcd: 620.1; Found: 620.6. In a vacuum-dried Schlenk flask under an argon atmosphere, a 1 M THF solution of Tetrabutylammonium fluoride (0.51 ml, 0.51 mmol) was added to a solution of 12 (72.8 mg, 0.12 mmol) in chloroform (25 mL). After stirring for 30 minutes at room temperature, water was added and extracted with chloroform. The crude was purified by silica gel column chromatography (CHCl3) to give 51.4 mg of 13 (78%) as a red solid. 1H NMR (600 MHz, CDCl3) δ10.3 (s, 1H, d), 9.83 (d, 2H, J = 4.8 Hz), 9.35 (d, 2H, J = 4.8 Hz), 9.05 (m, 4H), 8.32 (d, 4H, J = 6.0 Hz), 7.79 - 7.82 (m, 6H), 9.05 (m, 1H); MALDI-TOF Mass C24H20N4Zn Calcd: 548.1; Found: 549.1. In a vacuum-dried Schlenk flask under an argon atmosphere, porohyrin 13 (38 mg, 6.9 × 10-5 mol), 6 (20.4 mg, 3.14 × 10-5 mol), Pd2(dba)3 (16.3 mg, 1.57 × 10-5 mol), and AsPh3 (19.2 mg, 6.28 × 10-5 mol)) were dissolved in anhydrous THF (26 mL) and triethylamine (4.7 ml). After stirring for 2 hours at room temperature, water was added and extracted with chloroform. The solution was washed with saturated aqueous NH4Cl and water. The crude was purified by preparative GPC to give 10.3 mg of target (21%) as a brown solid. MALDI-TOF Mass C111H123N10O4Zn2 Calcd: 1582.5; Found: 1584.5. The effective two-photon absorption measurements were performed using an optical parametric oscillator (Continuum Surelight OPO) pumped with a THG beam (355 nm) from a Q-switched Nd:YAG laser (Continuum Surelight I-10)[4, 7a, 8]. The pulse width and the repetition rate were 5 ns and 10 Hz, respectively. The incident laser light was focused by a plano-convex lens (f = 100 mm) giving a beam waist of around 0.035 mm. The sample solution was placed in a 2 mm quartz cuvette and stirred using a magnetic bar during the measurement. Synthetic routes for the target molecule 2 are shown in Scheme 2. First, naphthalene-1,4,5,8-tetracarboxylic dianhydride was brominated using 4, which was prepared from isocyanuric acid with LiOH and bromine, to afford 5. Diimide 6 was synthesized by the reaction of 5 with octyl amine. Dipyrromethane 7 was prepared according to the literature. Porphyrin 9 was synthesized from 7 and 8 using trifluoroacetic acid in 15% yield. Monobromoporphyrin 10 was prepared from 9 using 1.5 equivalents of N-Bromosuccinimide (NBS) at –40°C in 48% yield. Bromoporphyrin 10 was metalated by zinc acetate to give 11. TMS-ethynylzincporphyrin 12 was obtained from 11 by the reaction with TMS-acetylene using a Pd(PPh)2Cl2/ CuI catalytic system in THF/triethylamine (TEA) in 78% yield. The TMS group in 12 was deprotected using TBAF to afford 13. The cross-coupling reaction of 13 and 6 was conducted by using Pd2(dba)3/AsPh3 as a catalyst system at room temperature to obtain the target 2, which was isolated using preparative Gel Permeation Chromatography (GPC) using pyridine as an eluent. The yield of the target was 21%. 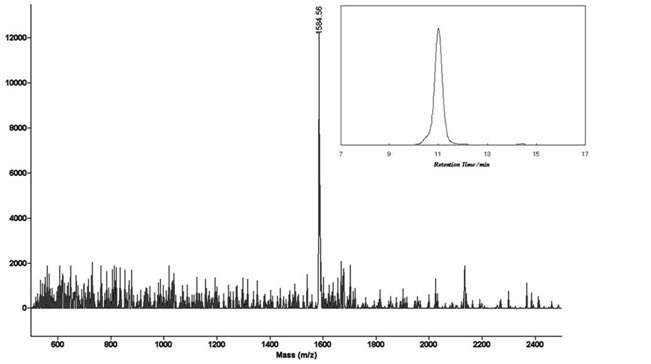 The purity and identification were confirmed by analytical GPC and MALDI-TOF mass, as shown in Figures 1. (Scheme 2) Figure 2 shows one-photon absorption spectrum of 2 in pyridine. The Soret and Q bands appeared at around 440 and 790 nm, respectively, which were redshifted compared with those of 12 indicating expansion of π-conjugation between porphyrins. The nonlinear absorption measurement was performed using a nanosecond open-aperture Z-scan method at a wavelength range from 960 to 1060 nm, where one-photon absorption was negligible. Figure 3 inset shows typical Z-scan trace of 5 × 10-6 M in pyridine at 980 nm with theoretically fitted curves according to the following equations. In this figure, normalized transmittances were plotted as a function of the sample position, z, and the dip was observed around the focal position due to nonlinear absorption. Scheme 2: Synthetic route for 2. Figure 1: MALDI-TOFF mass and analytical GPC (inset) charts of 2. 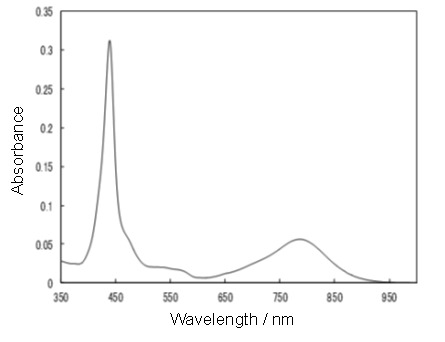 Figure 2: Absorption spectrum of 2 in pyridine. Figure 3: Effective TPA spectra of 2 measured using nanosecond pulses in pyridine and typical open-aperture Z-scan traces at 980 nm (inset). The maximum effσ(2) value was obtained as 10100 ± 2000 GM at 960 nm. The peak could not be measured at around 900 nm that was almost twice as long as those of the Soret band due to the existence of one-photon absorption. Although the peak could not be obtained for 2, the effσ(2) value obtained for 2 at 960 nm is 1.3 times larger than that for 1. In general, the effσ(2) value measured using nanosecond laser pulses is 2 - 3 orders of magnitude larger than that obtained with femtosecond pulses because of the contribution of excited state absorption (ESA) to the signal. This effect is difficult to separate from the pure TPA signal. Therefore, the values obtained in this study cannot be compared with the pure (2) values measured using femtosecond pulses, which were reported in most literatures. Even if the reported values were measured using nanosecond pulses, the fair comparison is difficult because the ESA contributions are different between the compound systems. However, in some applications using TPA materials (such as TPA-PDT or the creation of 3-D optical memory devices), a laser with a nanosecond pulse may be more appropriate because of the easiness of operation and availability. For this reason, we consider it important to examine the nonlinear absorption properties using nanosecond pulses. We have successfully synthesized novel ethynylene-linked bisporphyrin conjugated with naphthalene bisimide as an electron acceptor by palladium-catalyzed cross-coupling reaction. The purity and identification were confirmed by analytical GPC and MALDI-TOF mass. 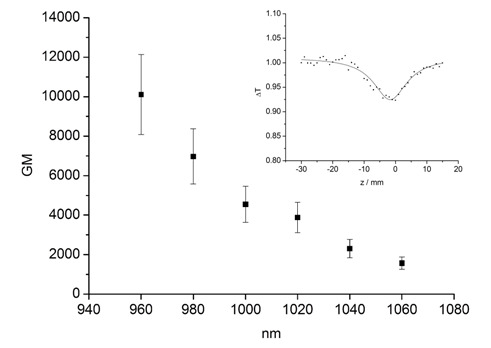 One-photon absorption spectra showed the red-shifted Soret and Q bands, indicating expansion of π-conjugation The maximum effσ(2) value including the ESA contribution was observed as 10100 GM at 960 nm measured using a nanosecond Z-scan method. This value was 1.3 times larger than the value obtained for bisporphyrin without electron acceptor. This work was supported by Grant-in-Aids for Scientific Research (C) (No. 15K05471) from Ministry of Education, Culture, Sports, Science and Technology, Japan (Monbu Kagakusho). 1. Parthenopoulos, A., Rentzepis, P.M. Three-dimensional optical storage memory. (1989) Science 245(4920): S843–S845. 2. Strickler, H., Webb, W.W. Three-dimensional optical data storage in refractive media by two-photon point excitation. (1991) Opt Lett 16(22): S1780-S1782. 3. Wachter, A., Partridge, W.P., Fisher, W.G., et al. Simultaneous two-photon excitation of photodynamic therapy agents. (1998) Proc SPIE-Into Soc Opt Eng 3269: S68-S74. 4. Bhawalkar, J.D., Kumar, N.D., Zhao, C.F., et al. Two-photon photodynamic therapy. (1997) Clin Laser Med Surg 15(5): S201-S204. 5. Nonlinear Optics of Organic Molecules and Polymers. (1996) CRC Press: Boca Raton. 6. Ogawa, K., Dy, J., Kobuke, Y. Substituent effect on two-photon absorption properties of conjugated porphyrins. (2005) Porphyrins Phthalocyanines 9(10): S735-S744. 7. Chaignon, F., Falkenström, M., Karlsson, S., et al. Very large acceleration of the photoinduced electron transfer in a Ru(bpy)3–naphthalene bisimide dyad bridged on the naphthyl core. (2007) Chem Commun (1): S64-S66. 8. Laha, J.K., Dhanalekshmi, S., Taniguchi, M., et al. A Scalable Synthesis of Meso-Substituted Dipyrromethanes. (2003) Org Process Res Dev 7(6): S799-S812. 9. Ogawa, K., Ohashi, A., Kobuke, Y., et al. Two-photon absorption properties of self-assemblies of butadiyne-linked bis(imidazolylporphyrin). (2005) J Phys Chem B 109(46): S22003-S22012. 10. Audebert, P., Kamada, K., Matsunaga, K., et al. The third-order NLO properties of D-π-A molecules with changing a primary amino group into pyrrole. (2003) Phys Lett 367(1-2): S62-S71. 11. Antonov, L., Kamada, K., Ohta, K., et al. A systematic femtosecond study on the two-photon absorbing D-π-A molecules–π-bridge nitrogen insertion and strength of the donor and acceptor groups. (2003) Phys Chem Chem Phys 5(6): S1193-S1197. 12. Dy, T., Ogawa, K., Satake, A., et al. Water-soluble self-assembled butadiyne-bridged bisporphyrin: a potential two-photon-absorbing photosensitizer for photodynamic therapy. (2007) Chem Eur J 13(12): S3491-S3500. 13. Tanihara, J., Ogawa, K., Kobuke, Y. Two-photon absorption properties of conjugated supramolecular porphyrins with electron donor and acceptor. (2006) J Photochem Photobiol A 178(2-3): S140-S149.